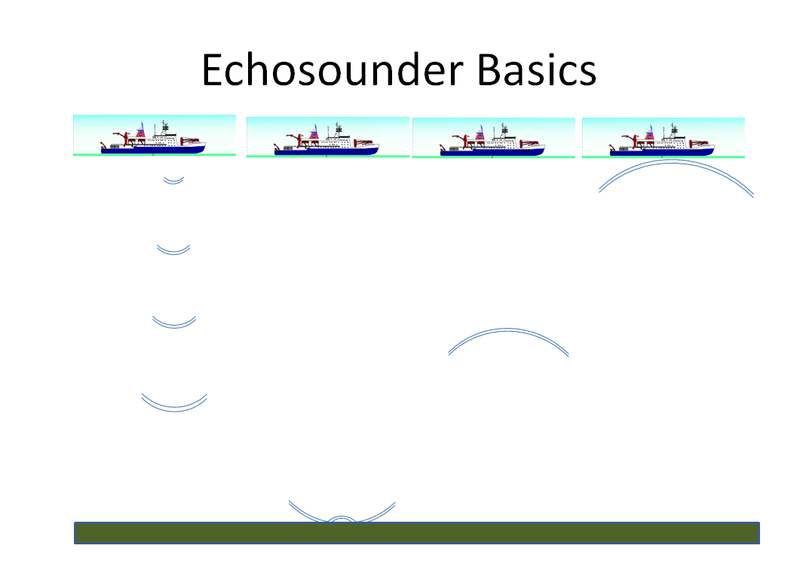 The science behind underwater acoustics play a huge role in the operations of the Pisces. Each of the five survey types (CTD, camera rig, sidescan, bandit reels and AUV) need accurate data about the depth and contours of the ocean floor. Most people are familiar with the idea of how radar sends out a “ping” and waits for a return in order to determine a distance of an object. This is not a new, or even a human invented design — bats, dolphins, and some whale classes use “echo location” to get information on food sources and predators. As a pulse is emitted from the transmission source, it travels through the water at a certain speed, and as it encounters objects, returns as an echo. As data is received, it can be read as a function of voltage output to time in seconds, but this type of information generally is not useful for operational purposes. This two-way travel data needs to be converted to provide a graphical representation of the contour of the ocean floor, and the location of objects in the water. An algorithm turns all of this into usable data, that gives the viewer a depiction of what is under the vessel, and at what depth. 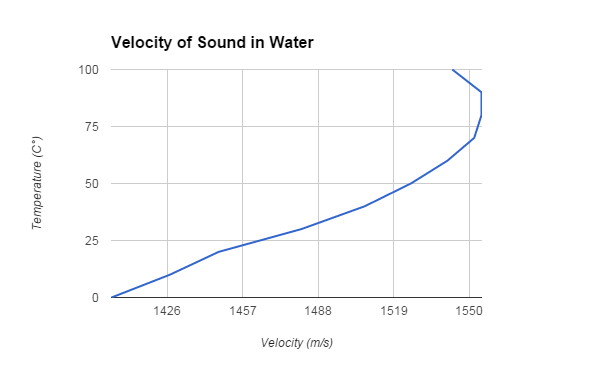 In order to get depth (Z), you need to know about how fast sound travels (c) – and this can vary with environmental factors such as temperature, salinity, depth, turbidity, etc. The third variable is the time (t) in seconds that it takes from ping to return. The formula that is used to calculate the depth is Z = c*t/2. During our cruise, the sound speed value we are using (1540 m/sec) is the mean value of the measured sound speed vs. depth profile, with slight margin of error on the minimum values. Therefore, any miscalculations based on the constant will provide a reading more shallow, rather than more depth. 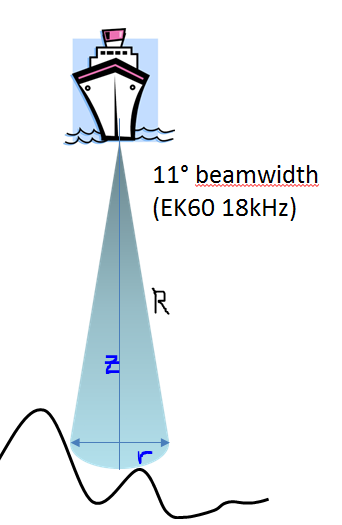 The EK60 echosounder emits a frequency of 18kHz, with most of the power in an 11° conic sector directed downward(see diagram). 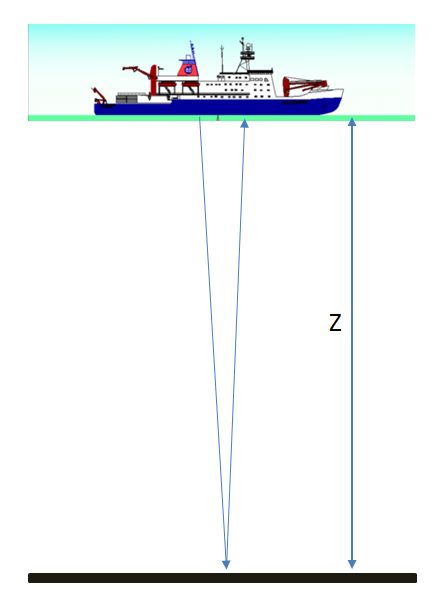 In order to find the area covered by the pulse, we first need to find the diameter (d) and the vertical depth (Z) or the max beam range (R). 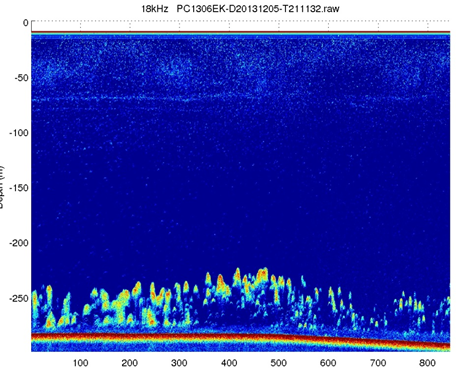 This entry was posted in 2015, Heidi Wigman, NOAA Fisheries Service, NOAA Teacher at Sea and tagged AUV, bandit reels, camera rig, CTD, Pisces, sidescan, underwater acoustics. Bookmark the permalink.